A technical vest that’s both environmentally conscious and incredibly comfortable, the Ellipse Vest is a hybrid-construction midlayer that uses strategically-zoned insulation for core warmth and protection. In the chest panels, Icebreaker used their MerinoLOFT™ insulation, which provides a warm, breathable and natural alternative to synthetic insulations, with a recycled polyester face fabric. In the body, the Ellipse features a super-soft and quick-drying blend of merino wool and recycled polyester with side stretch panels that actively manage moisture during cold, high-output days in the mountains or out on the trails. Zippered hand pockets and an internal stash pocket secure all your small daily essentials. 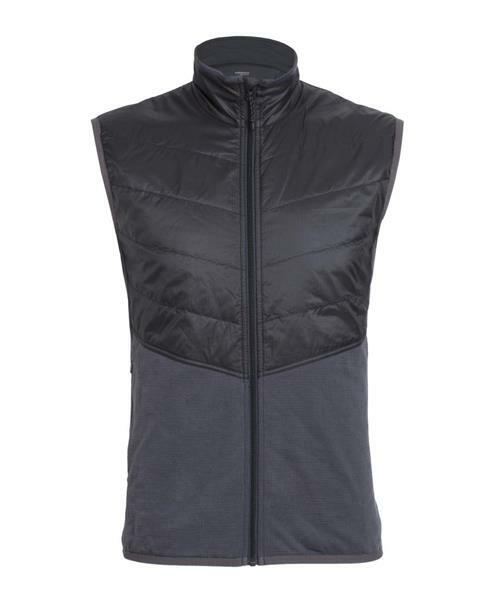 * Center back length: 72.8cm/28¾"
Ellipse Vest - Mens is rated 4.5 out of 5 by 16. Rated 5 out of 5 by joshualuichan from First time owner I've experienced icebreaker insulation as a baselayer while learning to snowboard this winter and have come to love the bombproofness of the product and brand. Now here I am placing an order for what I will guess is another smash hit with the Eclipse vest. It hasn't gotten cold enough to really stretch it to its limits, but I do feel that it will deliver. Just bumming around the flat with it is already really comfortable, can't wait to see how it works outdoors when the temps start dropping! Rated 4 out of 5 by Vance from Great vest for cool, outdoor runs. I bought this to supplement my outdoor running gear as I find layering jackets makes my runs too warm. It is light and warm enough. I bought this a size larger than I normally wear as it was stated it runs small and I plan to wear this over a couple layers. It fits for me as a medium. Rated 5 out of 5 by JAYNL from Great Baselayer/Outerlayer & everything in Between Perfect for the cooler Newfoundland evening as a top layer and I cant wait to use it in the fall and winter as a base layer for all type of activities. Extremely pleased with the product and I would recommend for anybody. Rated 2 out of 5 by Gregg47 from Thin. Short. I'm a slim 6ft 3 and found the Large too short. Product in general is extremely thin and not warm. As an example, you can hold the back panel over your eyes and see through it. The warmth to price ratio is extremely unfavorable. This is a summer vest and a light on at that. Rated 5 out of 5 by Mirandoos from Vest Love this vest so I ordered another one! The only time I can afford to buy icebreaker is when it goes on sale, then I go a little crazy and my wife gets mad. Maybe you guys can stop raising the prices so much. Rated 5 out of 5 by FranceAndYves from Perfect! Perfect for an extra layer or for the border line cold days in the fall or spring. My spouse and I both have this jacket we we both love it. Rated 5 out of 5 by bradmq2018 from Terrific vest Love it and will wear it a lot! Perfect addition to my layering choices along with my ellipse quarter zip hoody.